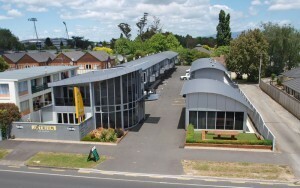 The Atrium On Ulster is a Hamilton accommodation offering a modern 28 unit, purpose built motel which opened in 2008. It is ideally situated on the “motel mile” on Ulster Street, Hamilton. As the property has a reasonably narrow road frontage and lies away from the road, the rooms provide a quiet haven for guests. Concrete tilt slab construction mean noise is eliminated between the two levels. The very popular Hamilton accommodation offers conference / meeting room along with free broadband internet access, gymnasium and off street parking make “The Atrium On Ulster” a desirable place to stay for both leisure and corporate travellers. Our Hamilton accommodation at Atrium On Ulster is ideally located as it is just a short walk to restaurants, supermarkets, parks and reserve or the Waikato Stadium. Atrium On Ulster’s Qualmark® rating of Four Star Plus is intended to confirm to travellers and guests, the type and room standard that we provide, plus the range and quality of the facilities and services offered at our Hamilton accommodation. Our Qualmark® rating of Four Star Plus (Excellent), assures you that the Atrium On Ulster, consistently achieves high quality levels for accommodation and services, in the provision of our self-contained and serviced Hamilton accommodation, so you the guest can book with confidence.